Ben is a Belgian draft horse standing 19 hands and weighing about 1,300 lbs. He is significantly larger than our other rescues and is gentle and kind. He arrived at BCHR from a neglectful situation but made quick friends with the other horses, who were most curious to meet him! Meet our sweet boy Koda! He arrived from North Carolina after his farm suffered damage from Hurricane Florence. 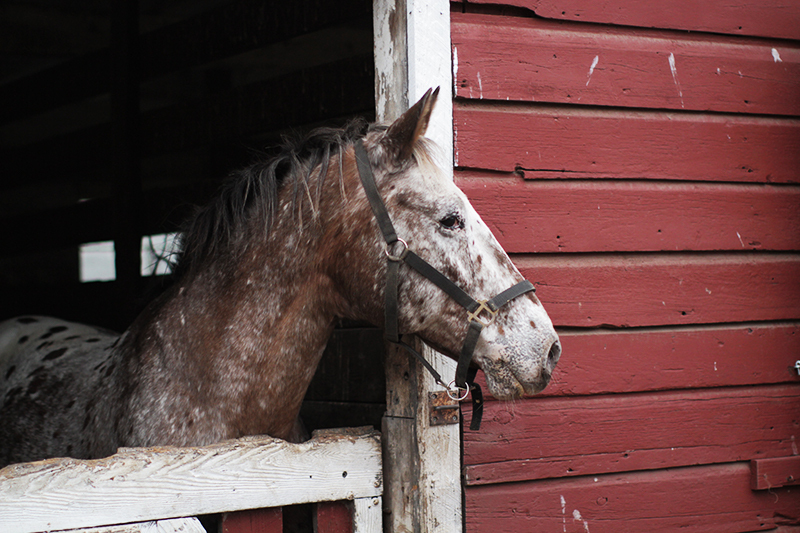 The minute he walked off of his trailer he made himself at home at the farm and in our volunteers’ hearts. Koda’s story is especially inspiring. He escaped one of the most notorious kill pens in Texas and made it to the Believe Equine Rescue in Roseboro, N.C. There he was rehabilitated and cared for by their wonderful volunteers. Unfortunately Koda has some special needs and suffered an injury to his back leg/foot, but he’ll receive much love and professional veterinary care with us! He’s already become close pals with Remy and Lazarus. 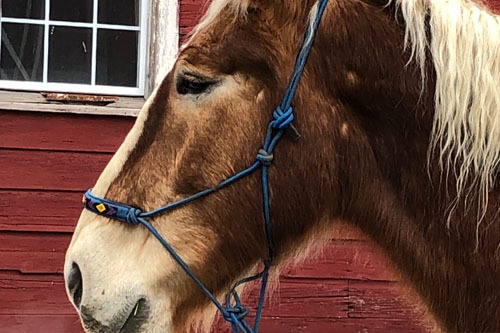 We spotted this underweight, discouraged, gentle soul on a Facebook horse auction site and we knew he needed to be rescued. On Thanksgiving eve, a Facebook message was shared with friends of BCHR, who showed up early on Thanksgiving morning to clean a field area near a stall, build a turnout in which to quarantine Lazarus while he got used to his new home, and confirmed his transport from the horse auction. 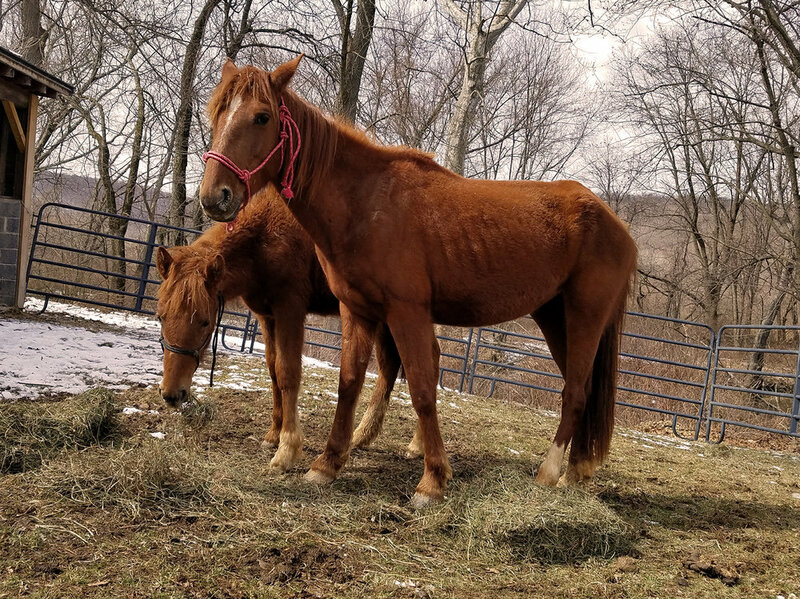 He’s now gained weight, is in a herd in another turnout and is loved and cherished by all of the BCHR volunteers, who give thanks to him and to all of the rescues every day. Miniature horses Thunder and Rain were up for auction with no takers. They huddled together in a small, dirty, crowded pen with other abandoned horses waiting to be sold at a New Jersey horse auction facility. Horses who are not bought at auction are often sent to Mexico or to Canada for slaughter, as this practice is illegal in the United States. The adoption price to bail out horses who are not auctioned must exceed the price that slaughterhouse meat buyers would pay for each horse. We traveled to the auction house to bail out Thunder. Several days later BCHR President Erin Giannios and her father drove the large BCHR horse trailer to the auction house to pick up Thunder and once they set eyes on his pal Rain, who wouldn’t leave his side, brought her home, as well. Now the two wander the farm and visit the other horses to share their hay. Our sweet mule Jack arrived at the Rescue from a farm that was forced to close and disperse its animals due to financial hardship. The owner contacted us and asked if we could take him. Jack now lives comfortably and happily among his equine pals in a large turnout. The lone mule at the Rescue, Jack is like the lovable little brother to all of the other horses. Jack is a 12-year-old mule and stands at 10 hands. Three years ago a horse dealer's trailer broke down by the farm. The driver asked if we could keep his horses in our stalls overnight until his trailer was repaired. Alas, the owner fixed his trailer and drove off with his horses. Several days later, however, BCHR volunteers discovered Luna in one of the stalls—the owner had secretly dropped her off at the rescue! He then contacted Erin to keep Luna, and she readily agreed, as Luna’s her next stop was to a kill pen, because she was elderly and had back and hip issues. This all transpired even before BCHR became a horse rescue. Fortunately Luna now has a permanent home at BCHR and grazes contentedly with the mares Saturn and Phoenix. I was drawn to him…something in his eyes, his face, his presence. I knew his deadline was up and that he’d be sent to slaughter the very next day, and I got an overwhelming feeling that I had to save him. He was simply abandoned. There was nothing wrong with him and I saw this. As soon as I walked into his stall he knew he would be okay. And so did I. I knew rescuing him was right. The day Oscar walked off of the trailer and into his new home at the farm he looked around, SAW at the group of volunteers who rescued him, and immediately decided he belonged HERE. He now shares a turnout with his pal Papichulo and they spend their days trotting around the fence together, sharing flakes of hay and enjoying constant hugs, kisses and attention from the BCHR volunteers. Our beloved Goldie passed away on February 4, 2019. We are devastated and tremendously sad, but know he enjoyed a long, wonderful life. Goldie was 43 years old and happily roamed the farm with his best pal, Summer. He was always content, got along beautifully with the other horses and gratefully received love from visitors and volunteers alike. He taught us all about grace, patience, wisdom and love. Leo arrived in the U.S. from Mexico, living first at local farm before coming to the Rescue. 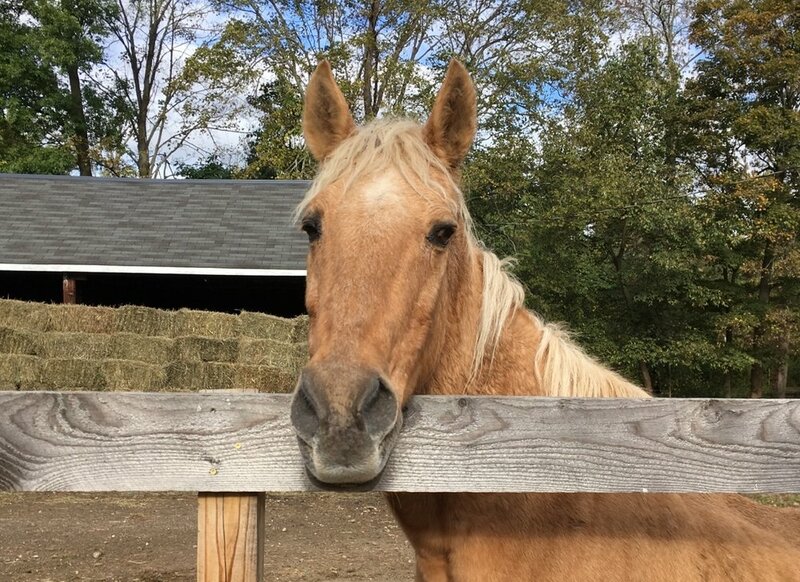 Saucy, spirited yet patient and loving, Leo has established himself as the unofficial leader of the herd of horses in his field, including Friendly, Emsy, Remy, Skippy, Patches and Jack, the mule. Leo has a deep and unique connection with special-needs children, and he’s always the first to run to the fence to greet visitors to the farm. Papichulo, a curious, sweet tempered Appaloosa who is blind in one eye, was abandoned by his owner and was living temporarily at another boarding facility. The facility’s owner was in debt and planned to send Papi and several other horses to auction to earn some extra cash. Fortunately the BCHR heard Papi’s story and rescued him before he was sent to auction where, if he wasn’t sold, might have been sent to slaughter. Plans are underway to help Papi receive a procedure to help maintain the sight in his good eye. Panda, an American Paint/draft cross, came at the rescue from a New Jersey farm. His previous owner there had rescued him from an Amish farm in Pennsylvania. At first, Panda was very apprehensive and afraid of close human contact. However, with much patience and love received from the many BCHR volunteers who spoke softly to him and fed him countless carrots, he now appears comfortable and content with visitors and also with Dusty, Jesse James and Vegas, who roam the wide, grassy field with him on the southern side of the farm. Patches is a majestic American Paint horse who arrived at the rescue after being abandoned by his owner. As borders at Mahrapo Farms, both Patches and Bailey developed an instant attachment to Erin. She covered their veterinary bills and expenses and they thrived under her expert care. Sadly, Bailey passed away at 32 years old. He was one of the original rescues and his beautiful spirit still inspires the many volunteers at the Rescue. Did you know that you can make specific donations to help these rescue horses? All funds go toward purchasing feed and hay, along with other necessary expenses directly related to our rescue horses' care. Your donation can help save a horse's life! Be sure to click donate now and join the many horse lovers who help the BCHR continue its compelling rescue efforts. 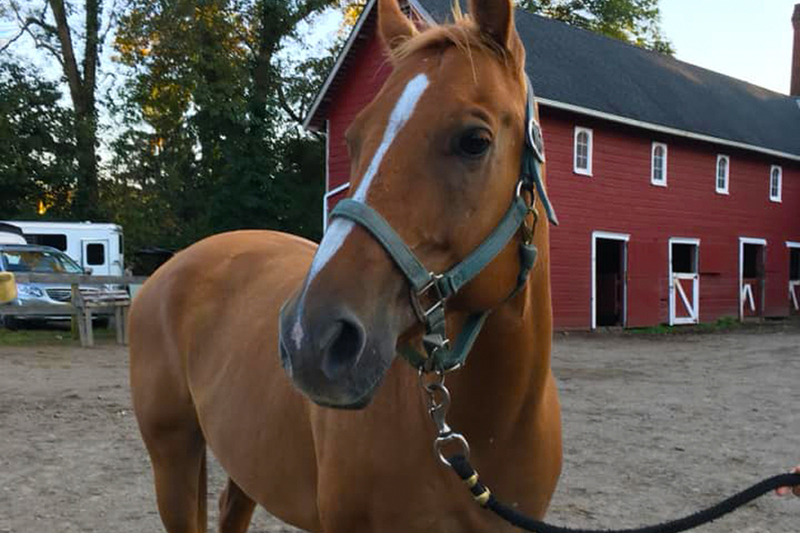 Emsy came from a thoroughbred breeding facility many years ago, but was considered too small and too slow to race. Over the years, several people have cared for him but without any consistency. Because of this, he's one of our permanent residents and is loved by everyone at the rescue, especially his friend Friendly, who never seems to leave his side. These chestnut beauties arrived on a cold, blustery day in March from Tar Heel, N.C., the day after a fierce blizzard. Warily, Saturn cautiously stepped from her trailer, Jupiter close at her side. Within an hour the two were interacting with our volunteers, eating apples and carrots. Now Jupiter shares a turnout with Olive and the two have become fast friends. Friendly is one of our original residents at the farm. He is a handsome chestnut and is loved by everyone at the rescue, especially his friend Emsy, who never seems to leave his side. This regal jet-black mare and her foal were adopted from a New Jersey horse auction after Erin was contacted by a horse advocate seeking their rescue. At that time there were six pairs of mommas and babies that were dropped off at auction. Fortunately the other pairs were rescued, and Phoenix and Olive were the last to be adopted. Buyers were hesitant to adopt them as they were considered completely feral. However, now Saturn and Phoenix roam a large, grassy turnout next to the creek, and Jupiter and Olive share a turnout across from a large herd in front of the farm.